sweet!!! The Freedom was one of my favorite gundams from the anime. Thanks for putting it up. i saw this wallpaper somewhere b4, this one is just mod a little. Yes, it is basically a mod. While the editing away of the original words, as well as the new background is certainly commentable, I feel that the yellowish shine on the Dragoon-wings and overall shine isn't neat enough. Nice work though, just needs a better shine. 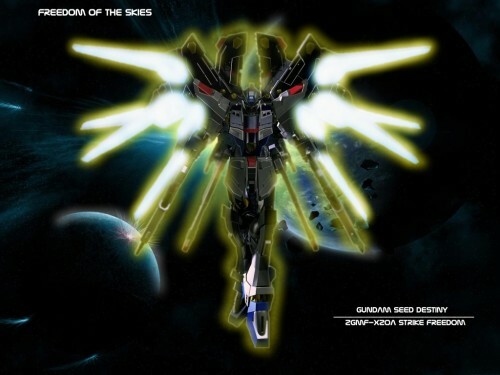 Very nice wallpaper, I personally like these kind of light clashing within darkness effects, plus strike freedom is in so nice job. I like the shining Dragoon very much. The image is very powerful emotions, I like it a lot better ever.